King Kong birthday party is a perfect theme for your child’s birthday celebration! Follow the ideas on this page to get your planning started! Make your King Kong party invitations using cards shaped like monkeys. You can get them from your local card store or make them yourself. To make one, start off by folding a piece of construction paper. Draw a picture of a monkey close to the edge of the fold. Cut it out with scissors keeping the fold “untouched”. Then write your King Kong birthday party information inside the card. As a variation, you can take a downloaded picture of King Kong and print it on the front of white invitation cards. Write your party details. Then decorate the cards by putting theme stickers all over. Finally, you can attach the invitations to such items as monkey beanbags or gorilla cups. Kids will be extremely delighted to receive such an awesome “invitation” in the mail. Choose black, silver, blue, red and green as colors for your King Kong party decorations. Use lots of balloons and paper streamers in those colors inside and outside your house. Play King Kong theme music in the background. Hang King Kong posters, and spread out other related memorabilia around the house. To go even further, you can find still shots of scenes from the movie, and hang them on the wall chronologically. Play King Kong DVD on the big screen TV (if available) during the entire party. Cover you King Kong birthday party table with a theme cloth. Print and laminate images of King Kong, and use them for placemats. Put King Kong Mylar balloon for a centerpiece. Hang a personalized “Happy Birthday” banner nearby. *Sandy Candy Activity: You can get “candy creation” kit from a party store. At activity time, have the kids create colorful candy concoctions that they can eat after dinner. For your King Kong party favors, give out such items as laser spinners, King Kong sticker sheets, paddle balls, colorful glow sticks, Pop Rocks® candy, and so on. *Pin the Gorilla on the Palm Tree: Draw a large palm tree on a butcher paper or poster board. Then draw and cut out gorilla shapes out of black (or brown) construction paper. Write guests’ initials and put a double-sided tape on the back of every cutout. At game time, blindfold the kids one by one, spin them around twice, and get them to stick their gorillas on the palm tree. The person to pin his or her gorilla the closest to a spot marked “X” on the tree, wins! *Best Roar Contest: Give each child a chance to demonstrate his or her best roar. When every King Kong birthday party guest has had a turn, switch to try the best demonstration of Ann Darrow scream (boys too). When all the children have had a turn, award prizes for the loudest, squeakiest, most real, funniest roar and scream. Enlist parents, neighbors, or older siblings to judge the competition. *Who am I? : Write the names of King Kong movie characters on strips of masking tape before the party, so each child will have one. At game time, attach a name to each kid’s back, bud don’t let them see it. *Skull Island Dinosaurs: Pick one or more players to be dinosaurs and everyone else is an islander. When the hungry dinosaurs hear the command “Feeding Time”, they must try to catch as many islanders as they can. When islanders get caught, they must go to a designated area called “the feeding pen,” where they must stand still with their legs spread apart. To be rescued, one of their islander-friends has to crawl through the captured player’s legs. Keep playing the game until everyone has been caught, or it’s time to move to the next game. *Balloon Stomp: Blow up a balloon for each player and attach a string. Have players tie the balloons to their left ankles, leaving about a foot of string between the ankle and balloon. On the word “Go!” have your King Kong birthday party guests attempt to pop one another’s balloons – without getting their own balloons popped! The last player with an intact balloon wins. *Penny Toss: Place a number of empty containers of varying sizes – such as tuna can, a juice can, and so on – on a platform. Set the cans up in random order, assigning each one a point value based on difficulty. Give the players ten pennies and let the kids toss them into the cans. Award different prizes for different point totals. *King Kong Wrap: In this King Kong birthday party game, children capture King Kong by wrapping him up so he can’t move, and King Kong breaks free. Divide your group into teams of 3, and hand each group a roll of toilet paper. Give each team a couple of minutes to decide who, in each of their groups, will be King Kong. Then announce, “Wrap them!”, and have the teams race to wrap up their King Kong, using every bit of paper. The first team to finish, wins. 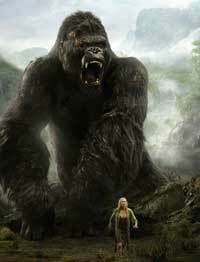 Watch each King Kong as they roar and break loose! *Carl Denham’s Acting Game: Carl Denham was the overly ambitious filmmaker in “King Kong.” Get the children to act as if they’re auditioning for his new movie by imitating famous characters from “King Kong” or other movies. Give the kids a couple of minutes to think who they’d like to impersonate. Next, one at a time, have each kid perform. Let the other kids guess which movie and character is being acted out. *King Kong Movie Trivia: Before the King Kong birthday party, enlist the birthday child to help you come up with King Kong movie trivia questions. (Be sure not to make them too hard.) Write the questions on separate index cards. Tape a large piece of paper on the wall for keeping score. Divide the gang into teams of two. Ask one group to draw a trivia card and question the team on their left. If a second team doesn’t have the answer, that (second) team loses a point. The next team may then take a guess. *Watch a Show: Let the kids watch “King Kong” movie DVD, so they can unwind at the end of the party. It’s also a great activity to occupy your guests while they are waiting for their rides. *King Kong Cake: Bake a rectangular or round cake according to cake mix package directions. Get a picture of King Kong and cover it with a piece of waxed paper. Next, trace the outline with a tooth pick, and frost sections of the cake accordingly (body, facial features, etc). *Skull Island Torch Sticks: For this King Kong birthday party recipe, you’ll need fruits and veggies (e.g., pineapple, onions, mushrooms, bell peppers, tomatoes, zucchinis, etc. ), Italian dressing and minced garlic. As an option, you can also have choice of meat prepared, marinated and grilled separately. Mix dressing and garlic in a pan and set it aside. Cut up vegetables and fruit into bite-sized chunks, and spread them out in pan. Marinate for about 30 minutes. Heat up grill. *Venture Boats: You’ll need 1 banana (per guest), mini marshmallows, chocolate chips and ice cream. Cut triangular flags from construction paper before the King Kong birthday party. Next, thread a toothpick trough each flag. Place each unpeeled banana on a square of foil and slice open lengthwise. Fill wedge with marshmallows and chips. Wrap all the bananas in foil and put them into a baking pan. Before snack time, preheat oven to 350°F. Place pan with ‘banana boats’ in the oven and bake for 10 minutes. Remove foil and place boat on a plate. Top each banana boat with a scoop of ice cream, insert a flag, and serve with a spoon. Children can eat right out of the boat (peel). *The Big Apples: For this King Kong birthday party recipe, you’ll need large apples, caramel squares (at least 10 per apple, unwrapped), water (a dash or few per apple), Popsicle® sticks, crushed cookies and nuts for dipping. Prepare bowls of cookies and nuts. Wash and thoroughly dry the apples. Insert Popsicle stick halfway into the stem area. Warm caramel and water on low heat until fully melted. Children can dip apples into caramel and place on greased waxed paper. Let stand approximately 20 minutes. Then invite your King Kong birthday party guests to dip and roll their apples in toppings of choice. *Skull Island S’mores: You’ll need chocolate chips, marshmallows and graham crackers. Place a spoonful of chocolate chips on half of a graham cracker, top with a marshmallow and heat in the microwave approximately 1 minute. (Keep on a paper towel or plate.) Then put the other graham cracker on top. *To make this King Kong party drink, you’ll need hot chocolate mix, milk, whipped cream, chocolate bar, 1/2 tsp of cinnamon (per cup) and cinnamon sticks. Make the hot chocolate and stir in cinnamon. Pour into mugs, top with cinnamon sticks and whipped cream. Create chocolate shavings by scraping top of chocolate bar with a butter knife. Sprinkle and serve. *Gorilla Juice: You’ll need white grape juice (or lemon-lime soda) and food coloring (several colors). Pour juice or soda into cups. Invite the kids to pick food coloring and add 2 drops per cup, stir and sip away!